I hope to accomplish what others have failed at, not to try and explain everything about Kerberos and SharePoint, but only to show how to get it working easy and how to verify that you have succeeded, with as little work as possible and with the Tools at hand if possible. Looking for the 2013 version of this guide? You will find it here. I have during my struggles found that there are a few steps that you always need to take, and most of the time you do these steps and then nothing else. Follow this guide and most of you will be all right, I will later on try to add the same simple steps for more ‘advanced’ scenarios as well, like with SSRS or RSS feeds, SQL and such. The steps I am talking about, what are they then…? Follow the guide below and you will find out. This guide can be downloaded as a whitepaper from the Microsoft Technet Gallery. This guide is also available in a SharePoint 2013 version, adapted to the slight differences in SharePoint 2013 preview. Note: To perform some of these procedures, you must be a member of the Domain Admins group or the Enterprise Admins group in Active Directory and you have to be a member of the Farm Administrators Group in SharePoint, or you must have been delegated the appropriate authorities. As a security best practice, consider using ‘Run as’ when applicable to perform these procedures. 1. Name Resolution An entry for the Web Applications URL must exist in either DNS or in the clients hosts file. 2. Service Principal Names HTTP SPN’s must be created for the Web Application URL(s) and its Application Pool service account. 3. Delegation The SharePoint Web Server must be ‘Trusted for delegation’ in Active Directory. 5. Verification of functionality(IMPORTANT!) Klist.exe on client must have a HTTP ticket for URL and User accountSecurity log on SharePoint Web Server must have event ID 4624 with user and kerberos. There are two ways to do this, one excellent and one less excellent, the lesser of the two is really only ‘allowed’ for developing or testing purposes, but it exists and should be taken into consideration. Testing is also something that you will want to do here, and the less modifications you must do that requires a service down or a (Service Management) change order at an early stage, the better. Use Hosts for testing, then DNS in production. Make sure that the URL of the Web Application has a A-Record in DNS, if not, you need to create it. A server that is joined to an Active Directory Domain gets a A-record created automatically, but verify that it is there. 1.1 Open DNS Management in Administrative Tools on a DNS server. 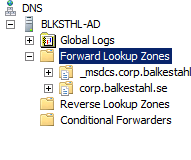 1.2 Expand forward lookup zones container. 1.3 Right click on the zone (domain name) and click on new host (A or AAAA). 1.8 Verify that the record has been created in the right pane. 1.9 In a Command Prompt, ping the Web Application URL. 1.10 You are now done with step 1, Name Resolution. Move on to step 2. Service Principal Name(SPN). Note: A known issue exists with some clients (IE7 and IE8 included) that causes kerberos authentication to fail with the use of DNS alias instead of an A-Record. Note: Always end the last line with a Linefeed/Enter, else you may experience issues using the hosts file. You are now done with step 1, Name Resolution. Move on to step 2. Service Principal Name(SPN). Note: To perform these procedures, you must have membership in Domain Admins, Enterprise Admins, or you must have been delegated the appropriate authority. For information on delegating the permissions to modify SPNs, see Delegating Authority to Modify SPNs. Note: To use setspn, you must run the setspn command from an elevated command prompt. To open an elevated command prompt, click Start, right-click Command Prompt, and then click ‘Run as administrator’. When creating or setting up your SPN’s, you need some basic information first, as you will be creating HTTP SPN’s you need a URL and a Service account name. 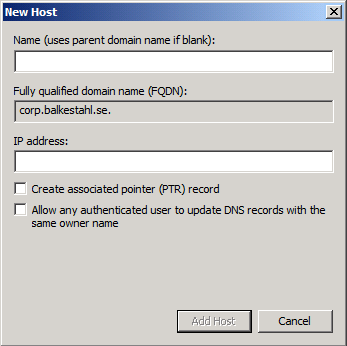 If the SharePoint Web Application has both a NetBIOS name and an FQDN, then you need to create separate SPN’s for both. Most likely, you get back nothing. This is ok. If you do get some registered SPN’s back, just make sure that they are not the same as the ones you are about to add, if they aren’t they you can leave them be. setspn -S HTTP/mywebappurl domain\serviceaccount (hit enter) Note: HTTP can be upper or lowercase, does not matter. Now, the result should be one more entry than you had before, you should see your new SPN listed. The necessary SPN’s have now been created successfully and the service will be able to request tickets in your name. Note: Using the -S parameter with setspn when creating an SPN will check for duplicates before creating a new one, thus eliminating the risk of duplicate SPN’s, which would cause Kerberos to fail. You are now done with step 2, Service Principal Name(SPN). Move on to step 3. Trust for delegation. Note: To perform this procedure, you must be a member of the Domain Admins group or the Enterprise Admins group in Active Directory, or you must have been delegated the appropriate authority. As a security best practice, consider using Run as to perform this procedure. 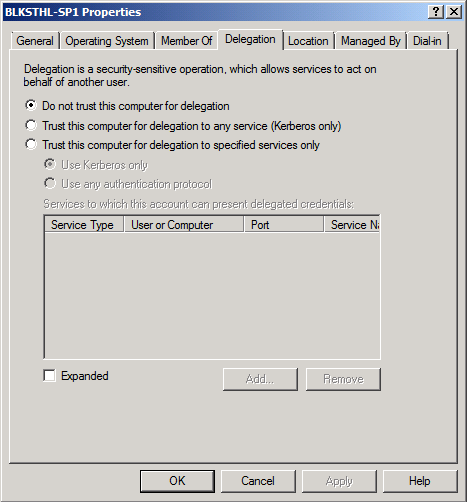 By default, no server is trusted for delegation, meaning that a service on a server in the Active Directory, cannot act on a user’s behalf, basically this means that a service if trusted for delegation, can impersonate a user and request a Kerberos ticket in the users name. 3.1 Open Active Directory Users and Computers. 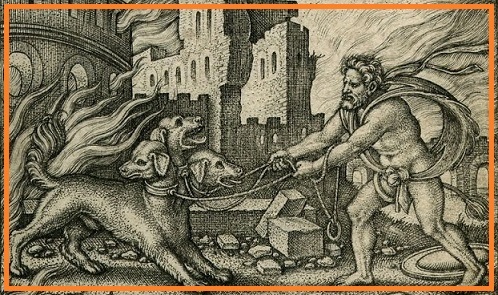 3.4 On the Delegation tab, click ‘Trust this computer for delegation to any service (Kerberos only)’. You are now done with step 3. Trust for delegation. Move on to step 4. Authentication Provider. Note: To perform this procedure, you must be a member of the SharePoint Farm Administrators group, or you must have been delegated the appropriate authority. Note: If you are creating a new Web Application at this Point, simply select ‘Classic Mode Authentication’ as authentication and ‘Negotiate(Kerberos)’ as Authentication provider in the Security Configuration dialog during Web Application creation. In order for the Web Application and SharePoint to use Kerberos instead of the default NTLM, we have to configure SharePoint to use just that. Unlike what many Think, there is no way to force SharePoint to use only Kerberos, what we have available is the option to use Kerberos if possible, else use NTLM. Don’t ask me why this is so, but this is what we have. However, if all of the Kerberos Components are configured correctly, this is what will be used for authentication at all times. 4.2 Select the Web Application you want to configure, and click on Authentication providers in the top ribbon. 4.3 In the ‘Authentication Providers’ dialog, click on the authentication provider you want to alter, usually its default. 4.4 In the ‘Edit Authentication’ dialog, verify that ‘Authentication Type’ is set to: ‘Windows’. 4.7 Scroll down to the end of the dialog and click Save. You have now made the modifications needed in SharePoint for Kerberos authentication to function, now we have to verify that the Changes has been made to IIS by SharePoint. 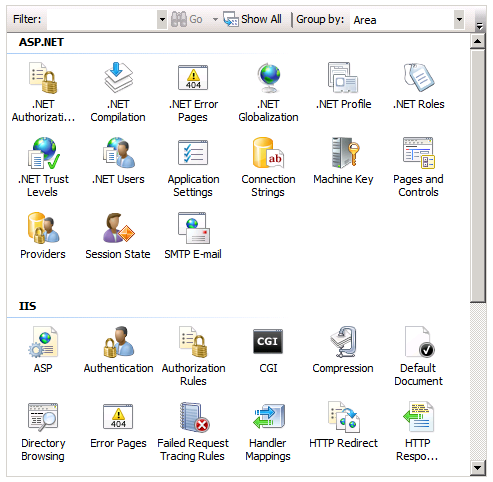 4.8 In Internet Information Services (IIS) Manager, locate the Web Application under ‘Sites’. 4.10 Select the ‘Authentication’ Icon and in the right ‘Actions’ pane, clikc on ‘Open Feature’. 4.11 In the Authentication dialog, select Windows Authentication (usually at the bottom). 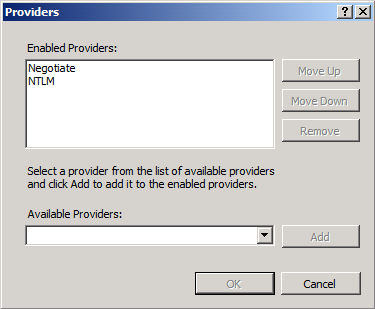 4.12 Click on ‘Providers’ in the right ‘Actions’ pane. 4.13 Verify that ‘Negotiate’ and ‘NTLM’ are the only ones listed and that they are listed in that order, ‘Negotiate’ at the top. 4.14 Click Cancel and then again in the right ‘Actions’ pane click on ‘Advanced Settings’. 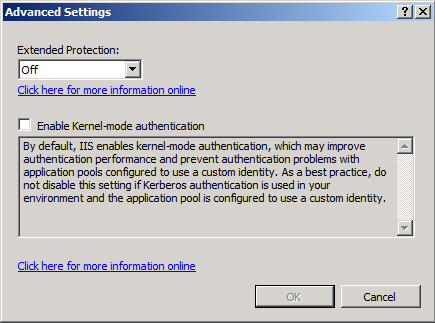 4.15 Verify in the ‘Advanced Settings’ dialog that ‘Extended Protection’ is ‘Off’ and that ‘Enable Kernel-mode authentication’ is unchecked. 4.17 Exit Internet Information Services Manager. You are now done with step 4. Authentication Provider. Move on to step 5. Verification of functionality. 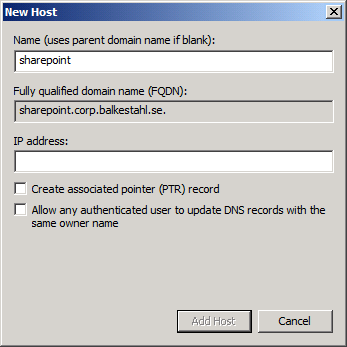 Note: DO NOT make any Changes using the Internet Information Services Manager, if Changes need to be made, Always use the SharePoint Central Administration interface. Another way to make changes to SharePoint is PowerShell, which is also a recommended way if you really know what you are doing. Before anything, Close down all open Internet Explorers or other browser sessions you have open. 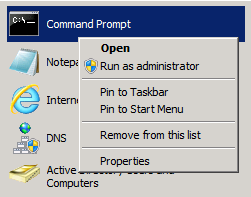 5.1 On the client, start a command prompt as administrator (Right click, ‘Run as administrator’). The tickets listed does not necessarily have anything to do with us at this point (SharePoint). 5.4 Now, we want to clean up this list so that we can see if a new ticket is granted to our user when logging on to SharePoint. 5.6 With an empty Kerberos ticket list, open up a new Internet Explorer session and go to the URL of the Web Application. And a few timestamps and similar stuff. This is good! If you see this ticket, things are working! Now, all we have to do is verify that it looks good on the Web Server as well. 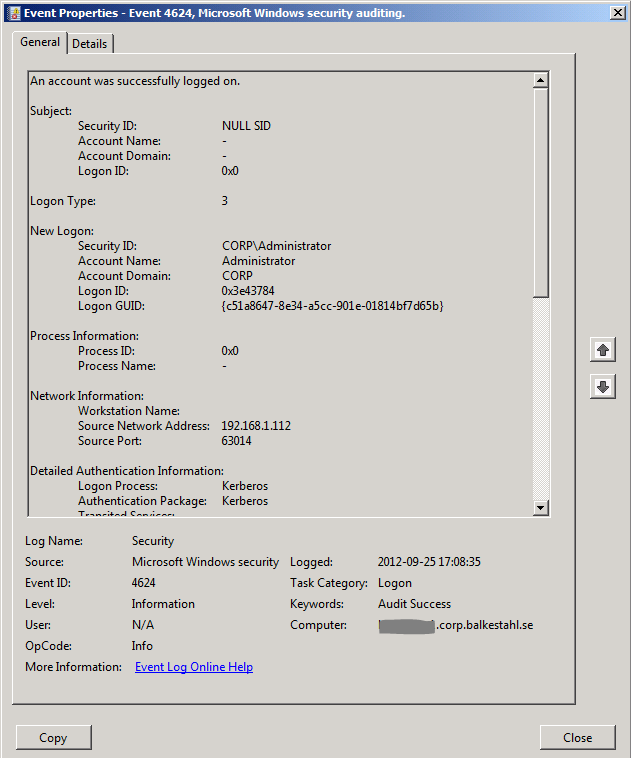 Close down the Command Prompt and move on to the next task in this guide, the security log. 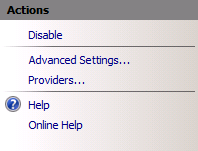 5.9 On the SharePoint Web Server, in Administrative Tools, open up Event Viewer. 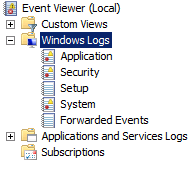 5.10 Expand the ‘Windows Logs’ container and locate the ‘Security’ Log. If you can verify that you do have this event, then you are done, Kerberos works! This means that if you have successfully completed all steps in this guide, you have managed to configure Kerberos for SharePoint. Thanks to, for technical and spiritual support! Sir, you dont know how much help you give by created a magnificent article like this, rigorously tested, concise steps, now i am deleting all of my bookmarks on Kerberos and only left 2 reference, Microsoft’s guide and yours ! Thank You ! That comment made it all worth it and you made my day by taking the time and giving the feedback. Hello Thomas. Phew!!. Glad to have stumbled on your blog entry about the often loathed but desirable Kerberos configuration for SharePoint 2010. I followed your steps and was able to authenticate with Kerberos, although I didn’t see my tickets in klist. Nevertheless event viewer on the web server proved otherwise. -In ADSI Edit window, expand the ‘Default naming context’ and expand CN=Users and then the user used for application pool in web application. -Right click on the user entry CN=UserName and select properties window. 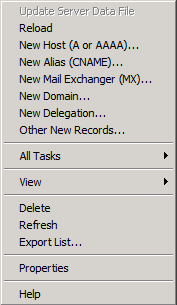 Then find the property ‘servicePrincipalName’ and then enter edit / add the SPNs in the edit window. 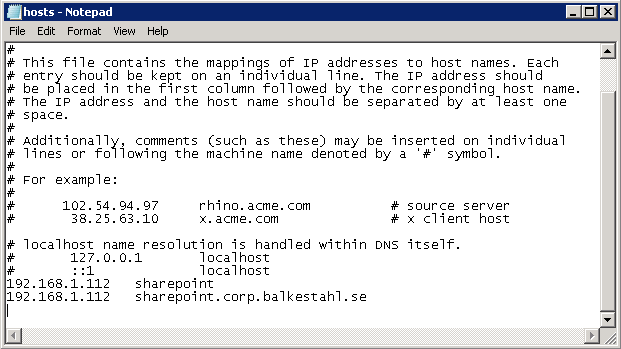 All in all though, you’ve done a very GOOD JOB (with screenshots too) in demystifying Kerberos configuration for SharePoint 2010 and I really do appreciate this. 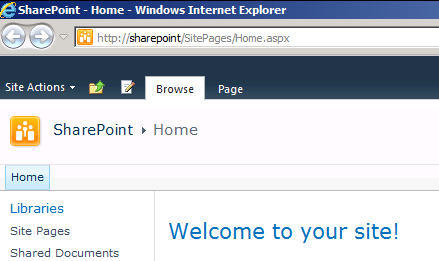 You’re certainly a credit to SharePoint world. Hi. Thanks for the feedback! I will take it into consideration, but the thing is, when doing an easy to follow guide you have to make a choice, it may not be the best approach at all times, but it is a working one and relatively easy to describe. I will look into the changes you suggested though. Regarding the missing tickets, are you an admin and did you look on the ‘client’? Hi Thomas. I agree with you. It was great to show people how to do it manually using Setspn – and would certainly increase their knowledge of the tool itself. Regarding klist, yes, I did log in as a an administrator and this morning I tried the steps again logging in as a Domain Administrator accessing services from a client machine (i.e. 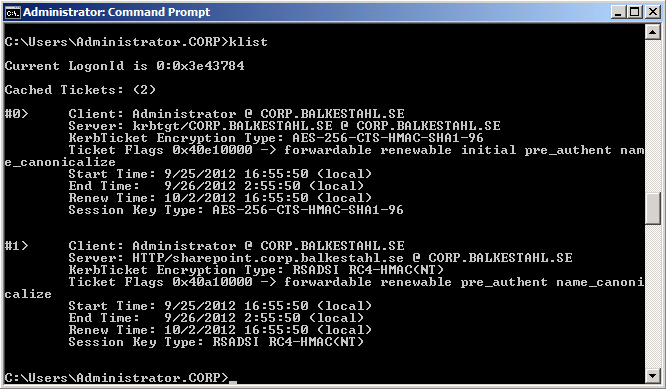 not from the SharePoint server) and ran klist as cmd > right click “Run as Administrator. I still didn’t get the ticket and timestamps – just the current log on ID and cache tickets = 0. This article is not as extensive as it may seem. For example, it doesn’t mention the SPNs needed for the SQL hosts, nor does it state anything about Kerberos constrained delegation (which is the way to go, especially when using claims-based authentication). Great article but i’m now having issues with logging into the web app i chose for kerboses. No one can log in? Any ideas? Look at your IE settings. SP URLs must be in the Trusted Intranet Zone for Kerberos to work, per MS. Might be a firewall too, ethier a proxy server or Windows software firewall. ‘Local intranet’ zone is the only setting that will work by default, trusted sites can be configured to logon automatically using logged on credentials. 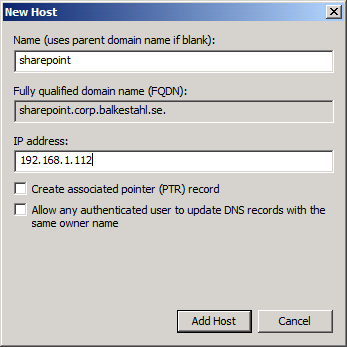 Very interesting in reading your article on Reporting Services SharePoint Integration with Kerberos enabled. Link? Excellent Post… Made Kerberos sound easy.. Thank you very much for the clear and concise post. I’ve got your page bookmarked, I’m sure I’ll need to refer to it again on my next SharePoint site. Saw the SP2013 as well, that’s actually what I followed first, but then I had to rip out the SP2013 because it evidently isn’t compatible with the version of Dynamics/GP we are running. The instructions were clear and easy to follow and I had the Kerberos authentication working on the first try in only a few minutes. Thanks so much for posting this, you made me look like a hero to my company execs! Awesome post, literally the only post I can find that helped me with this. Thanks. It has been nearly a year since you discussed an advanced set of notes covering SQL, SSRS, etc. I was wondering if the advanced notes for SP 2010 were still a project or whether that had been shelved for something else. Do you have time to speculate? Unfortunately, that never happened, sorry about that. Like you said, other things got in between.. I will mention, also, that in order to receive true security benefits from Kerberos – are there any other type of benefits? – then your whole ecosystem needs to be using it. This includes all of the web services that SharePoint relies on. And this is where configuration gets very sticky because the service accounts are running on the same server as the web apps, only under different ports and different user accounts. That info right there should be enough to get you started on what your SPNs need to look like to support all of the services that are on ports 32843, 32844, etc. Wow. After beating my head against the wall for a few hours, even after reading (or trying to) the TechNet articles, this and the 2013 guide got me up and running in what seemed like minutes with SP 2016 and Kerberos. Now my only question is, when is “The First Kerberos Guide for SharePoint 2016 Technicians” coming out? I’ll think about doing it.